After taking a summer hiatus from blogging I am back online and anticipate sharing a diverse set of activities and events from the international cultural sector. I welcome your comments and look forward to being of service here to the field that I care so deeply about. I am writing from Greece where I have recently finished a week working in Athens with the local dance community and through a generous Artist International Grant from the Arts Council England and British Council in Greece. The grant also covered costs for bringing in three international long-time colleagues and collaborators (Emma Cocker, artist-writer based in Sheffield, England; Roderick Shrock, Director of Eyebeam, NYC; and Rennie Tang, urban designer from Los Angeles) to scope out potential for a new project called Moving // Dialogues. More on that at a later date and as things develop. Entering into the studio of Kinitiras – an independently run dance space in the center of Athens, Greece – a deep-rootedness, a sense of grounding and of potential. On my first visit here, over a year ago, its founder and director Antigone Gyra showed me where the old city of Athens lay cemented underneath the studio. It is visible through a metal gate at the low-level of the sidewalk edge just outside and to the right of the studio. 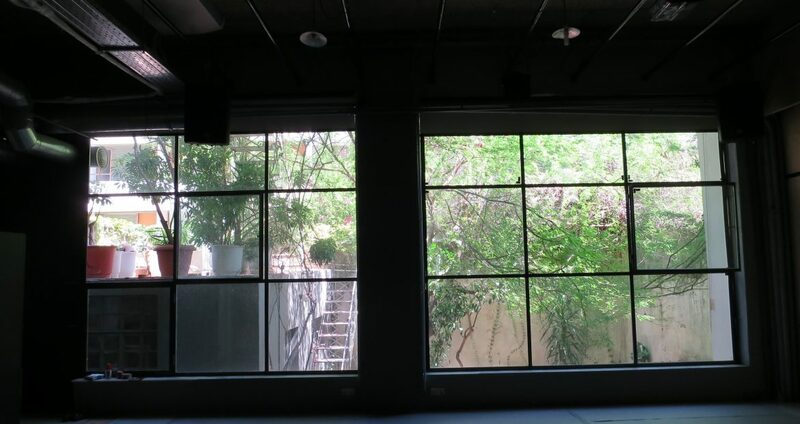 To the back of the studio, with its soft wooden walls and open dance floor, is a small green space welcoming those from the studio outside to sit around a picnic bench under a canopy of green and small, pink bougainvillea flowers. One tree, from the garden is gently nudging its way into the studio through the open window along the wall of steel and glass that visually connects interior to exterior. Supported by a brilliant staff, Kinitiras brings international dance artists and somatic practitioners to its space to engage with the local dance community through classes, workshops, performances and events. For one week, I was invited to work with a group of 8 local dance artists for three and a half hours a day to transmit Yvonne Rainer’s seminal dance work Trio A (1966) in the workshop titled Transmitting Trio A. As one of the five certified transmitters of the work, I often travel to teach it to dancers, visual artists, performers and the general public. This group was especially easy to work with given their strong dance training and intelligent insights and questions. Given limited time I was just able to teach them the dance by the end of the fourth day. It takes 15 hours to teach just the basics and, according to Rainer, another 15-30 to rehearse it up to performance quality. We invited the public in for a lecture-demonstration and exchange on the last day of the workshop. What struck me was the high level of engagement and hunger for learning that the group offered to the experience. There is on department of dance in Athens at the American University, a private school. These brilliant dancers await the day they can get an internationally recognised degree in dance from a public university in Athens. Hopefully, that day is not that far away. In the meantime, Kinitiras fills a gap and offers excellent opportunities for engagement, learning and exchange. I look forward to a continued relationship with Kinitiras and the city of Athens and want to share my gratitude for the support from my home country that allowed such a rich exchange. Thank you!